What is Italy famous for? Why pasta of course! 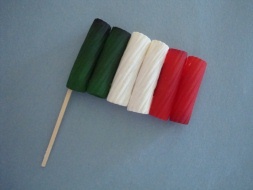 Which is why this Rigatoni Italian Flag is a great craft for this kids to make when learning about Italy! 1. You need to have 2 green, 2 red and 2 white rigatoni. You can paint all your noodles with regular acrylic or tempera paint. Or you can paint the white ones and use food coloring to color the red and green pasta. Simply put a few drops of food coloring into a bag, add you pasta, seal the bag, and then squish it around until the noodles are covered. These will dry very quickly. 2. Glue your Rigatoni together. Start with the 2 green, then the 2 white, then the 2 red. You will have to keep them laying on something flat as you are gluing them. Glue a toothpick into the first green noodle. Make sure it has time to dry before you pick up your Rigatoni Italian Flag!